Thing were going very well for Brooklyn attorney Thomas E. Stillman at the turn of the last century. Born in Manhattan in 1837, he was one of five sons of Alfred Stillman. Now the head of the law firm Stillman & Hubbard with offices at 40 Wall Street, the 1906 Memorial Cyclopedia of the Twentieth Century would call him "one of the best known and most successful lawyers of the city." He and his wife, the former Charlotte Elizabeth Greenman (she went by her middle name), had four daughters, twins Jessie and Helen Elizabeth, Mary Emma, and Charlotte Rogers. The Stillmans maintained country homes in Tuxedo, New York and New London, Connecticut. With Thomas now essentially retired in 1899, he and Elizabeth laid plans to move from Brooklyn to Manhattan. That February Stillman purchased the 35-foot wide plot at No. 9 East 78th Street, just east of Fifth Avenue, from Stanley Mortimer. He paid a significant $81,667 for the undeveloped lot--more than $2.5 million today. The Stillmans commissioned architect Charles Coolidge Haight to design the residence. His choice of the neo-Renaissance style, a favorite of Upper West Side architect Clarence True, was unusual on the east side of Central Park. Completed in late in 1900, the dignified Indiana limestone mansion rose four floors over an American basement. The entrance portico, supported by paired stone Ionic columns formed a balcony at the second floor. Competing with the portico for prominence was a two-story three-sided bay capped with another carved balcony at the fourth floor. The fifth floor took the form of a dormered mansard mostly hidden behind a stone parapet. The interiors reflected the Stillmans’ wealth and sophistication. The Italian Renaissance reception hall was paneled in elaborately carved Santo Domingo mahogany. Fluted columns with bronze capitals graced the entrance of the main hall, which was covered in red velvet to set off a costly collection of paintings. A mahogany staircase with a solid bronze balustrade wound up the four floors. Red velvet within by antique metal borders graced the walls of the library. The woodwork here was of imported Circassian walnut. Fronting 78th Street was the French salon, decorated in the Louis XVI style. The walls were covered with a greenish-blue damask woven in Italy for the room. A paonazza marble mantel was complimented by satinwood woodwork. Connected to the salon was the music room in the newly-popular Colonial Revival style. Here mullioned windows looked out to the inner court. Rosewood pillars inlaid with brass led back to the main hall and a wide passageway led to the dining room–also Colonial Revival--with antique quartered oak and a beamed ceiling. Only months after the family moved in tragedy struck. Elizabeth Stillman died in her bedroom of pneumonia on February 20, 1901 at the age of 57. Living on in the house with their father were the still-unmarried Charlotte and Mary. Both women were active in philanthropic and social causes. They were, for instance, highly involved in the White Rose Mission, a "Christian, nonsectarian Home for Colored Girls and Women." It had been formed in 1897 by Victoria Earle Matthews, a social reformer and former slave. 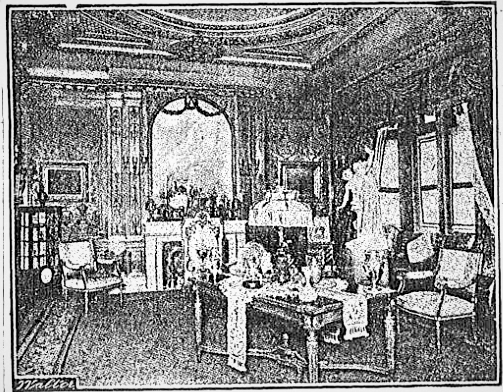 On April 13, 1902 the New-York Daily Tribune reported "Mrs. William J. Schieffelin, Mrs. Henry Howland, Miss Grace Dodge and Miss Stillman have arranged for a drawing room talk earlier in the day [of April 22] at the house of Thomas E. Stillman, No. 9 East Seventy-eighth-st., for the benefit of the White Rose Mission." Newspapers followed the movements of Stillman and his daughters as they sailed to Europe or to their country homes. On February 28, 1904, for instance, the New-York Tribune reported "Thomas E. Stillman, Miss Mary Stillman, Miss Charlotte Stillman...were at Tuxedo last week." That would be among the last of Mary's trips with her father and sister. Her engagement to Edward S. Harkness, son of Standard Oil mogul Stephen Harkness, had been announced. The groom was 30-years-old and Mary was about six months younger. Perhaps because of their ages, or because of the couple's disdain for ostentation, theirs would be a "home wedding" in the Stillman mansion. The New-York Tribune reported on November 6, 1904 "Only relatives and close friends have been invited, but a few extra cards have been sent out for the reception which follows." The wedding took place on November 15. Among the "close friends" attending were the John D. Rockefellers and the John D. Rockefeller, Jr.'s, the extended Sloane families, Augustus D. Juilliard and his wife, the Henry M. Flaglers, and William J. Schieffelin and his wife. Charlotte was her sister's maid of honor. The Sun reported that the ceremony took place "amid floral decorations which were profuse and beautiful...in a drawing room hung in reseda brocade and finished in carved satin wood, resting on Italian marble." An awning had been erected from the entrance to the curb under which a "soft carpet" was laid for the arriving guests. Policemen and detectives were posted to prevent “curious loiterers” and other detectives were inside to watch over the wedding presents of gold, silver and jewelry that were displayed on six large tables. As Mary was in her bedroom dressing, a horse-drawn cart driven by an elderly black woman, accompanied by a small boy, pulled up at the awning. Police rushed in to move the woman along. Ignoring them, the she handed the reins to the boy and instructed him to move the cart down the block. The woman marched up to the front door where a liveried servant attempted to stop her with no more success than the police had had. Thomas Stillman came to see what the commotion was, only to recognize a former servant, “Aunt Celia,” who had helped rear the children back in Brooklyn. When she approached old age, Stillman had bought her a farm in New Jersey and built her a comfortable house. The old woman had no intentions of missing the wedding and had brought along two presents: a home-grown pumpkin, which she claimed was the largest in New Jersey, and a barrel of red apples. Like a cherished, long-lost member of the family, Aunt Celia was ushered upstairs to Mary’s room where she watched the bride dress in her white chiffon gown. She then followed closely along as the wealthy socialites filed into the drawing room for the ceremony, where she wept “after the fashion of old people on joyous marriage occasions,” according to The New York Times. Charlotte and her father continued their social routine, sometimes joined by one or more of the married sisters. On February 12, 1905, for instance the New-York Tribune noted that "Thomas E. Stillman and his daughters, Mrs. William Ambrose Taylor [Jessie] and Miss Charlotte R. Stillman, were also passengers on the Deutschland. They will join Mr. and Mrs. Edward S. Harkness in March. The Stillmans will spend the summer at their New-London place." The following summer Thomas and Charlotte were in Europe. They completed what The Times called "an extensive automobile tour of Switzerland and Italy, before returning to Paris. On July 19, 1906 the newspaper reported, "Thomas E. Stillman, the well-known New York lawyer, accompanied by his daughter, Charlotte; his granddaughter Elizabeth, and a party of friends...started from Paris at 10 o'clock yesterday for Lisieux in an automobile driven by an Italian chauffeur named Carsughie." The group had gone 200 miles when they stopped for lunch. Shortly afterward, a horrific incident occurred. According to the chauffeur, he was suddenly "overcome by an attack of vertigo and was temporarily blinded." The New York Times said "The automobile rushed forward unguided" at a high rate of speed, before smashing into a heavy miller's wagon. In the car was Charlotte; the attorney’s granddaughter, Elizabeth; Andrew Carnegie’s niece; and other friends. The car, which flipped over, was demolished and Stillman was thrown into the road. He never recovered from his injuries, dying in a French hospital two months later. A little over two weeks afterward the funeral was held in drawing room of No. 9 East 78th Street. On September 26 The New York Times remarked "Many well-known lawyers and business men of the city attended the services." Still unmarried, Charlotte remained in the house. She continued to occupy the Tuxedo and New London homes; but often traveled with the Harknesses, as well. They were frequent guests at Charlotte's homes, and she at theirs. Charlotte was at the Connecticut estate in 1908 when she fell seriously ill. On June 22 the New-York Tribune reported "Mrs. William Armstrong is in New London, where she has been called by the illness of her sister, Miss Charlotte Stillman, who has typhoid fever." Two months later, on August 27, the newspaper noted "Mr. and Mrs. Edward S. Harkness have returned to New London, Conn., from Lenox, where they have been with Mrs. Harkness's sister, Miss Charlotte Stillman, who is recovering from a long and serious sickness." It was no doubt her medical condition which prompted Charlotte to take an apartment at the Devon on West 55th Street for the following winter season. That she would not return to the East 78th Street mansion seemed evident when the house house was leased to the multi-millionaire Stephen C. Clark "for a term of years" in December 1910. 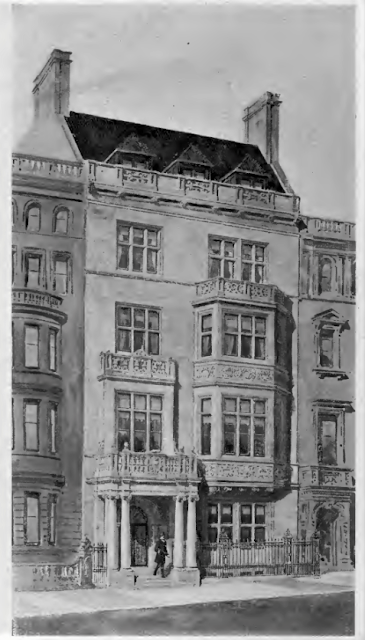 Following the expiration of Clark's lease, the house was rented to William T. Hyde who, as reported in the Real Estate Record & Guide "recently sold his expensive residence at 11 East 70th st., just east of the new H. C. Frick residence." Living in the Stillman mansion was an expensive prospect. Rent on the 10-year lease was $10,000 per year; or about $260,000 today. As it turned out Hyde stayed only about five years. In 1919 the Stillman estate sold the house to Edward Daniels Faulkner, wealthy owner of the upholstery firm of Johnson & Faulkner. Before he and his wife, the former Marianne Gaillard, moved in, the French jeweler Pierre Cartier leased the house for the winter season. Edward and Marianne had married in 1885. Their summer home, Pinecroft, was at Woodstock, Vermont. Like Edward and Mary Harkness, the couple enjoyed using their massive wealth for the benefit of others rather than for show. Edward Daniels died in September 1926, leaving an estate of more than $6 million. The Sun called his will "one of the most unusual" on record." He divided the ownership of his firm--valued at about $2 million--among his employees, "who served me long and faithfully." Marianne received $3 million outright (more than $42 million today), and another $1 million was set aside "for the establishment of a fund for the study, treatment, alleviation and cure of arthritis, to be known as 'The Faulkner Fund for the Cure of Arthritis.'" The widowed Marianne spent less time in Manhattan, preferring Pinecroft. She not only established the Edward D. Faulkner Clinic, but the Faulkner Trust to aid Woodstock residents in need, the Woodstock Recreation Center, and funded the Faulkner House at Mary Hitchcock Memorial Hospital in Hanover, New Hampshire. An endowment to the Dartmouth Hitchcock Medical Center is still active. 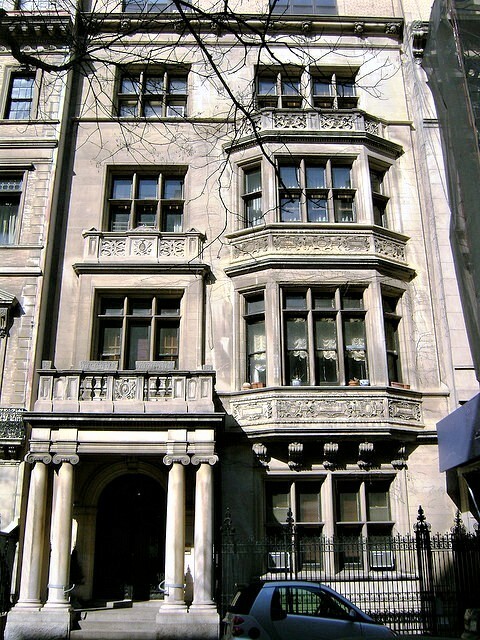 In 1946, after Marianne sold the 78th Street house, it was converted to three apartments per floor. The mansard was remodeled as a rather featureless blank-faced penthouse level. That level contained three apartments as well. The following September the showrooms of V'Soske, Inc. opened here. The decorator shop featured the hand-woven carpeting of designer Stanislav V'Soske. Perhaps the most celebrated of the tenants of No. 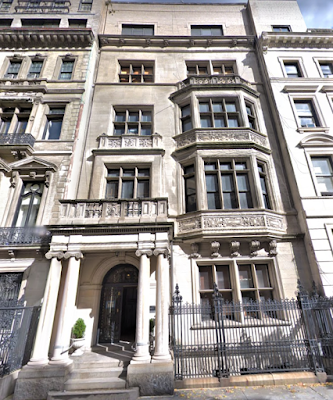 9 East 78th Street over then next decades was noted sculptor Elizabeth Richard. Her apartment and studio were here in 1953 when she became engaged to Franz Matsch, Austrian Consul General. The exterior appearance of the original four floors of the Stillman house is remarkably unchanged. Despite the architecturally regrettable penthouse, the residence retains its architectural dignity.